What did you think of The Honeymooners? 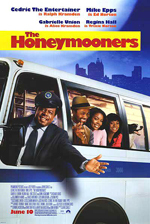 The Honeymooners is a movie that I was very curious about. How well will they incorporate the new with the old (spinning off of the old tv sitcom)? Will it be slapstick funny or have clever dialogue? What situations will Ralph and Norton be in? Well, here are the answers: Not well, not funny and dumb. Cedric the Entertainer plays Ralph Kramden, a New York City bus driver who has tons of dreams and no money. He spends his time trying to “get rich quick” with his buddy Ed Norton (Mike Epps). Their wives, Alice and Trixie (Gabrielle Union and Regina Hall) are always in the guys face about wasting money and not getting them the house of their dreams. So that is basically the storyline here, with the ladies wanting the house and the guys trying to get enough cash to replace the money that Ralph took out of the savings account for crazy schemes. The men try everything for some cash, from break dancing in the streets to finding a dog in a dumpster and sending him to the track. The acting in The Honeymooners was pretty decent considering what they had to work with. John Leguizamo was by far the funniest and most interesting charactor as Dodge, the streetwise dog trainer. Between Leguizamo and Epps I did find myself chuckling at a few bits but mostly just shook my head alot wondering why the didn’t try to bring this to a different level. I was impressed that they did make this a comedy that most of the family could enjoy, without me having to watch out for bad language or delete scenes. Fortunately they didn’t go the “raunchy” route, which would have made it even more painful for me to view.